As a child, Melissa Newman embarked on a new adventure every day after school. Just yards from her home, she and her two sisters would explore a nearly 40-acre expanse in northern Westport where she skipped through fields of billowy grass, marched through sloped forests and ran alongside the rushing waters of the Aspetuck River. "We were kids, we had no boundaries," she said. "We just went barreling over there whenever we felt like it. It was kind of lifesaving for me to have a place to go that was quiet and wonderful and nurturing." Now, the daughter of the famed acting couple, the late Paul Newman and Joanne Woodward, can relive those expeditions thanks to a new partnership that safeguards the land that served as her playground. The town and the Aspetuck Land Trust, a regional environmental nonprofit organization, on Sunday will officially open the Newman Poses Nature Preserve, safeguarding the site of her youthful forays as open space for the public. "I'm just so excited for people to see it and go there," Newman said. "It seems to me to encompass everything that a piece of land in Connecticut could." The preserve's opening culminates a process that began in 1997. That year, the town bought about 30 acres of the preserve's land from the family of Lillian Poses, a friend and neighbor of the Newmans who served in the Franklin Roosevelt administration. The same year, Newman and Woodward donated to the town eight acres that they owned, which were adjacent to the Poses property. Philanthropic by nature The Newman Poses Nature Preserve is a 39-acre town-owned property managed by the Aspetuck Land Trust. It consists of two parcels -- one that was donated to the town by the late Paul Newman and Joanne Woodward and another that the town acquired from the family of Lillian Poses. Encompassing forest, wetlands and a meadow, the Aspetuck River passes through the southern section of the site. The Newman Poses Nature Preserve officially opens Sunday. Public access is free. The preserve is located on Bayberry Lane Extension, next to the Aspetuck River. A map of the site can be found at http://www.aspetucklandtrust.org/maps/ALT-001-map_newman_poses.pdf. More information about the preserve and the Aspetuck Land Trust can be found on the land trust's website, www.aspetucklandtrust.org. Melissa Newman, an Aspetuck Land Trust board member and Westport resident, said her parents made their donation to motivate the town to preserve both their tract and the land acquired from the Poses family as open space. "The idea to preserve the property really originated with my father," she said. "He just didn't have the chance to take it to home plate." Paul Newman was also a longtime supporter of the land trust, which maintains more than 1,700 acres of open space in Westport, Weston, Fairfield and Easton. He provided substantial financial backing for projects such as acquiring the Trout Brook Valley preserve in Weston, according to Jonathan Wagner, chairman of the land acquisition committee. "We considered him a great friend," Wagner said. "He put his heart and soul into helping the land trust preserve land." But the idea of a new nature preserve in Westport only developed into a specific plan after Paul Newman's death in 2008. As the community debated ways to memorialize the actor and philanthropist, Melissa Newman and her younger sister, Clea, proposed to the Aspetuck Land Trust, and then First Selectman Gordon Joseloff, turning the land the town had acquired in 1997 into a designated nature preserve. In 2009, the Planning and Zoning Commission approved the land's re-zoning as open space. The land trust subsequently embarked on an 18-month restoration of the preserve that included the construction of a new boardwalk by Westport Boy Scout Troop 100, three new pedestrian bridges over preserve watercourses, more than a mile of new trails, as well as the planting of 1,000 narcissus bulbs at the preserve's entrance on Bayberry Lane Extension. 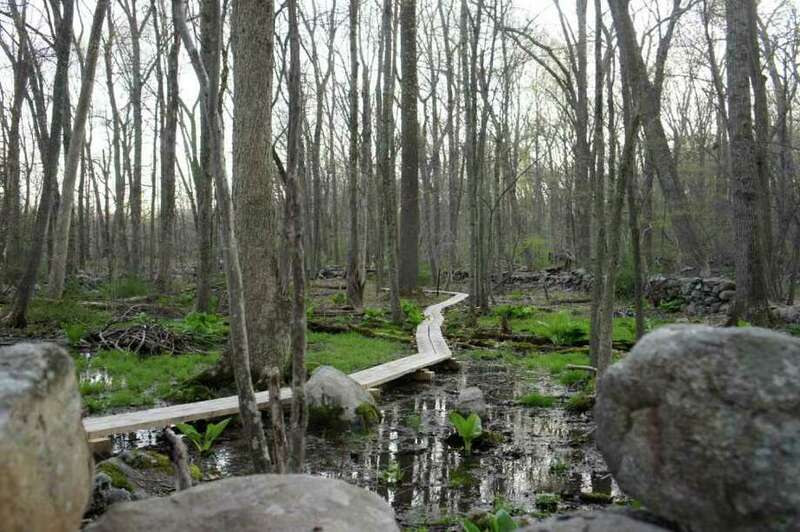 The land trust paid for the improvements to the preserve, which cost approximately $20,000. While the town still owns the land, funds from the land trust will pay for maintenance of the property. The preserve also advances a major objective of the 2007 Town Plan of Conservation and Development, which called for more open space in Westport. "This is a very significant parcel." said Conservation Department Director Alicia Mozian. "There really aren't any other town-owned open spaces in the northern part of town. It's going to serve that neighborhood very well." About three miles from downtown Westport, the preserve hosts a range of flora and fauna, such as ground-nesting birds and Highbush Blueberry shrubs. "This preserve really has a sense of the wild, which is pretty unique," said Aspetuck Land Trust Executive Director David Brant. "I was there and ran into a herd of about 12 turkeys." That "sense of the wild," Newman said, resembles the quality of the land when her parents bought their home near the preserve in 1961, the year that she was born. Although he generally eschewed accolades, Newman added that her father likely would have supported lending his name to the preserve. "I look skyward, and I think this is something that he would totally approve of," she said. "I think he would be really into this."